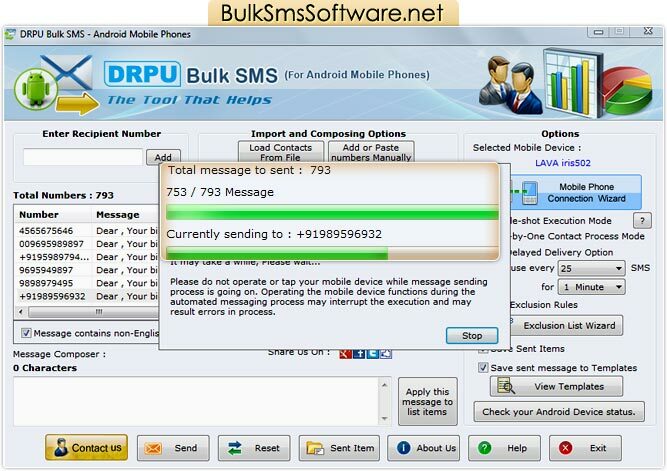 Home >> Bulk SMS Software for Android Mobile >> How to send bulk SMS from Android Mobile Phone ? How to send bulk SMS from Android Mobile Phone ? 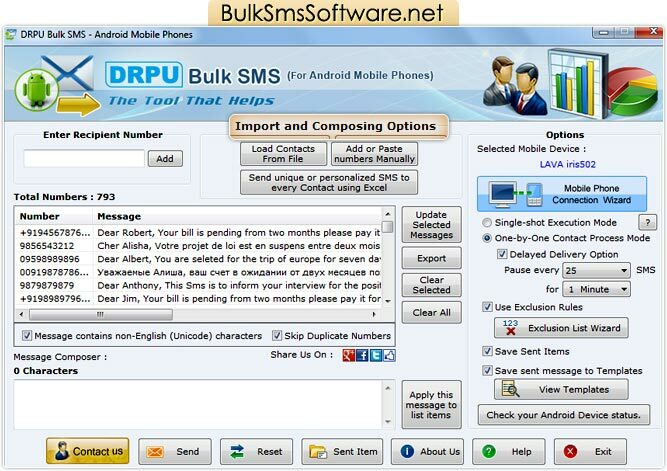 For sending bulk SMS software first connect your android phone with PC. Learn more about connection process. Enter recipient Number to whom you want to send sms and click on add button. You can use ‘Import and Composing Options’ to load contacts from saved file or send personalized SMS to Contact using Excel. After loading contact numbers and their respective SMS, recipient numbers will display on the Number and Message List window. Now Type the message you want to send in the Message Composer window. You may also click on Apply this message to list items button to apply composed message to list of contact number items for bulk messaging. Now select “Notification” or “Standard SMS” as per your need. Notification: You can send the Notification sms that only displays on the mobile screen of recipient and will not save in the Inbox folder of mobile phone. Standard SMS: You can send the Standard SMS that is stored in the Inbox folder of the recipient mobile phone. ➮ Note: You can also select various other feature of our software to apply on message sending process such as Delayed Delivery Options, Save Sent Items Exclusion Rules etc. Now you have to select 'Single Shot Execution Mode' or 'One by One Contact Process Mode' any one mode to send SMS. ➩ In “Single Shot Execution Mode” complete list of Numbers is queued to your Mobile Device in Single Shot. ➩ In ‘One by One Contact Process Mode', each number in the list is executed individually to send SMS.